Drive your dream car without any limit on a real racetrack. With one-on-one coaching, we provide everything you need to focus on your driving, and experience the supercar thrill of a lifetime. Voted the best thrill ride in Las Vegas, ride as a passenger while a professional racer takes you for the supercar full speed experience. Drifting is available with the Corvette Z06. Perfect for guests and kids 13 years and older. Experience outdoor go-kart racing! Go head to head with your family, friends and even celebrities, as VSK driver’s lap times will be recorded in the Vegas Superkarts timing system and will be compared against all drivers. Do you want to be faster in a supercar on a racetrack? The HPDE provides you with in-depth training so you can dominate the track in a Porsche, a Ferrari, or a Lamborghini. Private coaching and skid-pad activities are included. 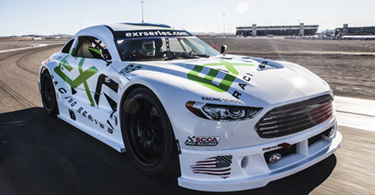 This is the next level experience for drivers who want to pilot a real racecar on a racetrack. Drive the EXR LV02 for 12 laps, or attend our racing school programs and add your fastest lap time to the leaderboard. An Exotics Racing driving experience is the most exhilarating gift for any occasion. With our all-inclusive pricing, select a pre-built gift package or specify your own dollar amount. We are open 7 days a week in Las Vegas and every weekend in Los Angeles. Confirm your cars choice and customize your experience by choosing your number of laps. Please provide the driver information. Please provide the passenger information.